Two cups of butter, four cups sugar, one tablespoon vanilla, eight eggs, two cups flour, one cup cocoa, and one cup chocolate chips. As indicated by the smiles of the bakers, the beaming faces of the servers, and the looks of appreciation by the clients of the Lowell Transitional Living Center, those are the ingredients in the recipe for joy. The Lowell Transitional Living Center (LTLC) is a community supported, non-profit organization that provides a safe, temporary shelter for homeless men and women in the Greater Lowell area. Through its Community Meals Program, the shelter provides three meals per day, 325 days per year to homeless individuals and low/no income individuals living in the community. On the second Thursday of each month, however, several members of the Tewksbury Congregational Church get together in the church kitchen and bake up six giant batches of brownies, enough to feed 150 people. The ingredients are donated by various members of the church -- some who bake, others who just donate. It's truly an intergenerational event -- with teens, adults, moms with children, grandparents, grandchildren, and occasionally some Confirmands all taking a turn at cracking the eggs or trying to incorporate the dry ingredients into the mixture without getting a puff of flour dust or cocoa powder into the air. Within an hour, the smell of rich, chocolately, brownies wafts throughout the building, bringing smiles to the faces of those who happen to be meeting in other rooms. Carol Sturtevant, who heads up the project with fellow member Sherry Fulton, said that being involved with the brownie baking over the past two years has been a very rewarding experience. "It has given me the opportunity to get to know some of the youth and adults in our church family on a more personal basis while doing something for someone else," she said. It takes about two hours for the brownies to be mixed and baked. They cool overnight and another team comes during the day to cut them up into large dessert portions and pack them for delivery. The brownies are then picked up by the serving team, who also bring four gallons of milk, to serve with the brownies. Many recipients regard real whole milk as just as much a treat as the brownies. Most times LTLC clients are served in a food line, but on brownie nights when Tewksbury volunteers are there, the clients are encouraged to take a seat and are served restaurant-style, with volunteers waiting on them. "It is so hard for me to just say a few words about LTLC," said Jean Metcalf, one of the regular servers. "I will start by saying that it brings tears to my eyes just thinking of what LTLC means to my husband Noel and me. We get so much out of serving at the shelter. As we walk in, wearing our red shirts, we see smiles on all the faces and hear chatter that 'the brownie people are here.' We respect all the clients at the shelter and treat them with love, caring and respect, and in return they appreciate our service. We try to give them peace and love during the time they eat their meals." Tewksbury Congregational had bright red t-shirts printed with their church name on the back and "Mission Outreach Team" on the front. Whenever anyone performs outreach or a service, they are given a shirt to wear so they will be recognized by the community. 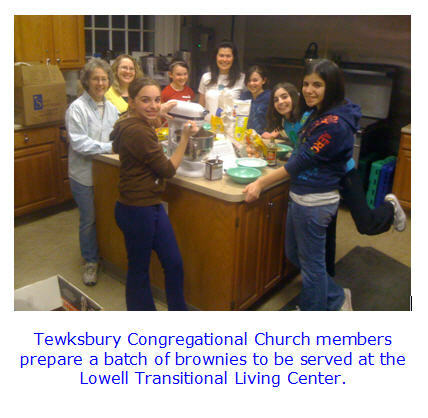 Another team of Tewksbury members serves at the LTLC kitchen on a Sunday night, but brownies are not served. "I have had the added bonus of serving the brownies at LTLC," said Sturtevant. "The clients really do love our homemade brownies! Seeing their smiles when they are served a brownie or two just warms your heart." And the smell of joy just wafts in the air. Carol, Noel, and Jean can be reached through the Tewksbury Congregational Church office at 978-851-9411 or tewksburycc@verizon.net.